Designer duo Francesca Rinaldo and Alessandro Gallo have done it again. 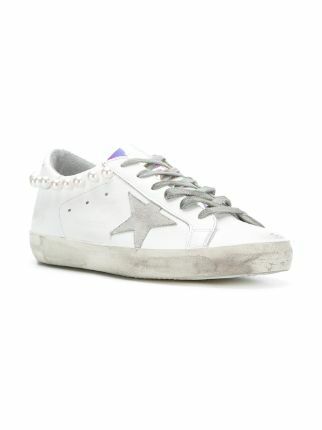 From vintage-inspired cowboy boots to their famous distressed sneakers, Golden Goose’s latest footwear collection will inspire fashion lovers everywhere. 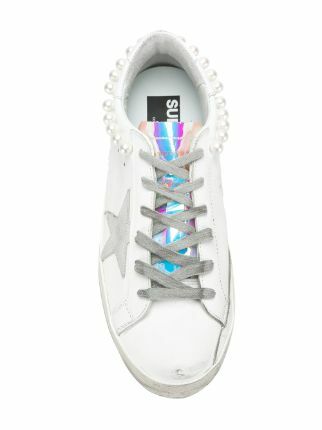 These white leather Superstar sneakers from Golden Goose Deluxe Brand feature a round toe, a lace-up front fastening, a signature star patch detail to the side, a branded insole, a flat sole, distressed effects, an iridescent plating at the tongue and embroidered faux-pearl details.